Everyone is probably aware of the Direct-To and how it functions on a GPS-enabled device. But what if I told you that there is actually two types? Direct-To any point outside your flight plan (like in an emergency diversion). Direct-To a future (or past) waypoint within your flight plan. You’re flying along your flight plan and experience some sort of safety concern (like a sick passenger), so you decide to divert to the closest suitable airport. 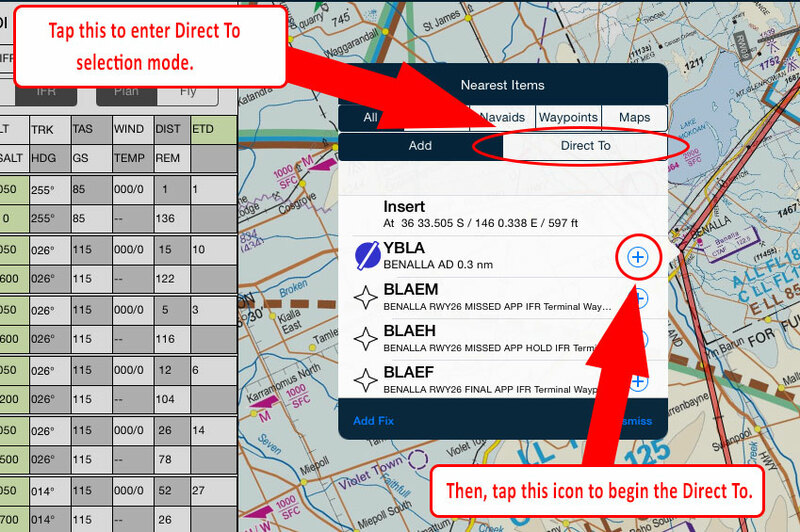 In this case you have an active flight plan, so tap near intended point on the map and the Nearest Items will appear. Tap the Direct-To switch at the top of the list and then tap the blue plus to track direct, at which time a magenta track line will appear from your present position to that point. You could also use the Direct-To button at the top of the En Route page, which would bring up a list ordered by distance. Once you’re on the ground, you can then close that flight plan then re-plan the rest of the trip. You’re flying along in Controlled Airspace and ATC instruct you to turn and fly a much shorter track directly to a point later in your flight plan, missing one or more intermediate waypoints. 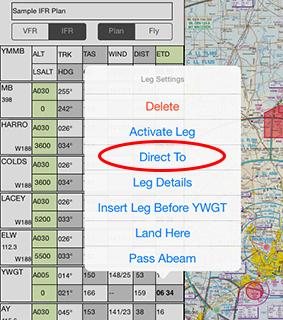 In this case tap and hold on a leg in the flight plan, a Leg Settings menu appears. Select Direct To from that list. A magenta line will appear from your present position to that waypoint in the plan. The beauty of this form of direct to is that once you reach that point, the auto sequencing will occur and you can continue along the rest of your flight plan. This makes complying with ATC instructions a breeze! One final note: If you find that you’ve accidentally started a Direct To without any flight plan active, simply tap the large “TO” field in the HUD to cancel it.